Now that its been a couple of years of living with an on demand hot water heater (also called a tankless hot water heater), I wanted to put in my two cents. When I renovated the house I really didn’t want anything to do with a regular hot water heater. A: they take up a ton of room and B: They run out! Seriously, it just seemed to me that common sense would say that heating the water ONLY when you need it would be a lot more economic then paying to keep a huge amount of water hot all of the time. So, how’s that been working out for us? Well, there’s a lot that goes into that answer! First, I want to say that I have no regrets. I was the one that installed my on demand hot water heater and it wasn’t at all hard to do. If, for instance, your big old tank hot water heater dies suddenly and you decide to replace it with an on demand instead, you could literally get it done (by yourself) in a weekend with a little bit of basic electrical and plumbing knowledge. This is not a tutorial on how to install one of these bad boys but I will say that they take a TON of electrical power. You will wonder, as you’re installing it if you are, in fact, installing a bomb in your basement. Nothing else electrical in your home will come close to the ampage these things need to run. I spent over $600 on the enormous electrical wires alone and the huge breakers to run this thing and, during all of that and because of it, I did wonder if it was going to cost a fortune every time I wanted hot water. 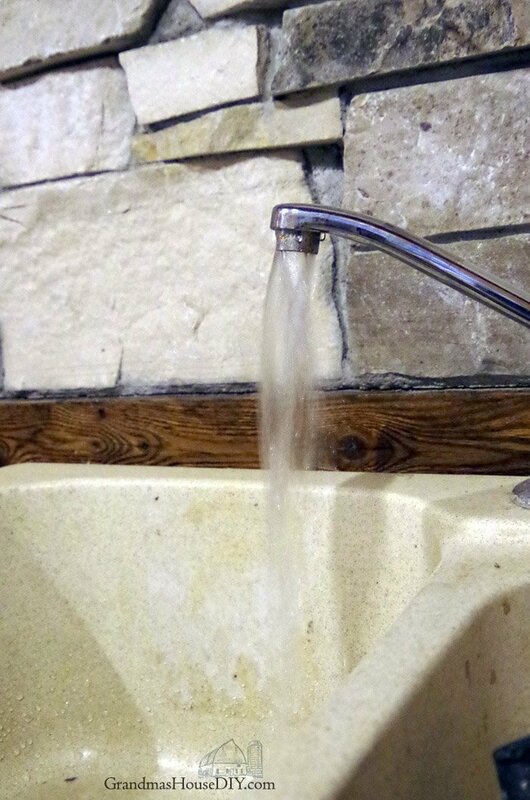 At my kitchen sink, my shower and sink on the main floor and my sinks/bathroom down in the basement, I have no problems and get hot water there without delay and without incident. (my water heater is directly beneath my kitchen in the basement.) However, if I mix the hot water (at any time at any of these locations) with more then a little cold water I run the risk of the hot water heater cutting off completely. Here’s the thing with these on demand water heaters: If you don’t run enough water through them they’ll either cut off or not kick on at ALL. I have a well here and a pressure tank so my water pressure isn’t even comparable to say the water pressure most people get in town on city water. None of this would be a problem if A: you live in town and have great water pressure and/or B: You have a water softener. 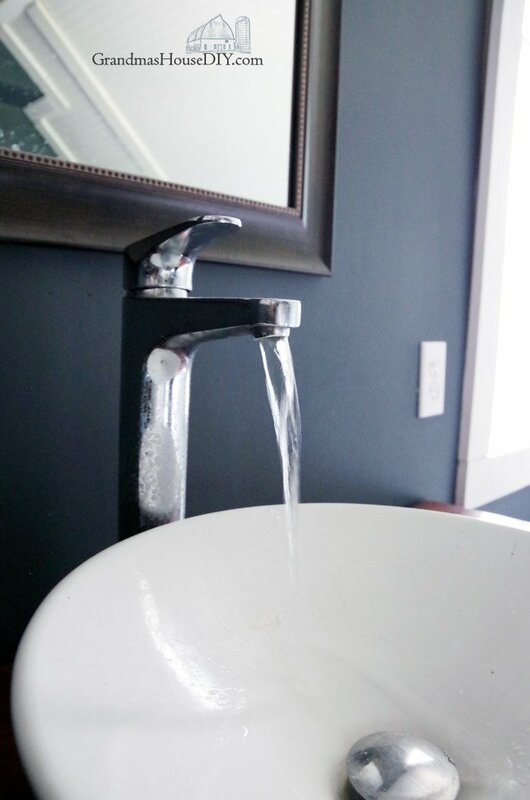 Our special little mix of low pressure well water and no water softener is causing us these annoying issues that most folks just wouldn’t have. 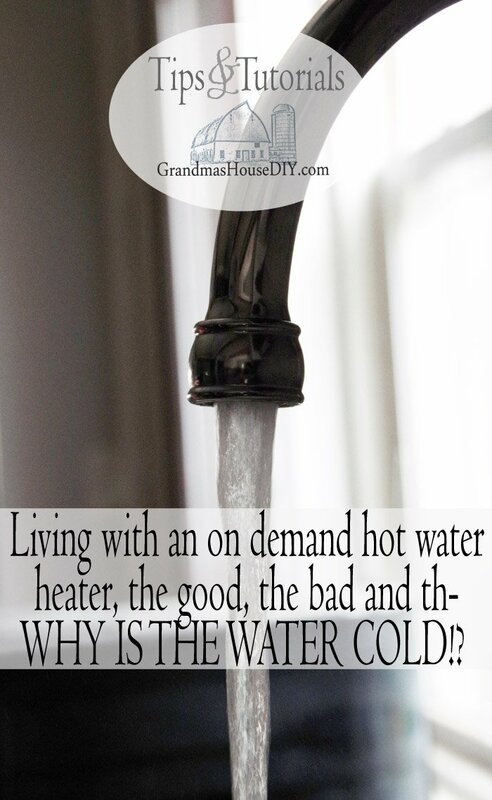 Do I regret our on demand hot water heater now that I’m living with these issues? No, because in the end, it is not that big of a deal. 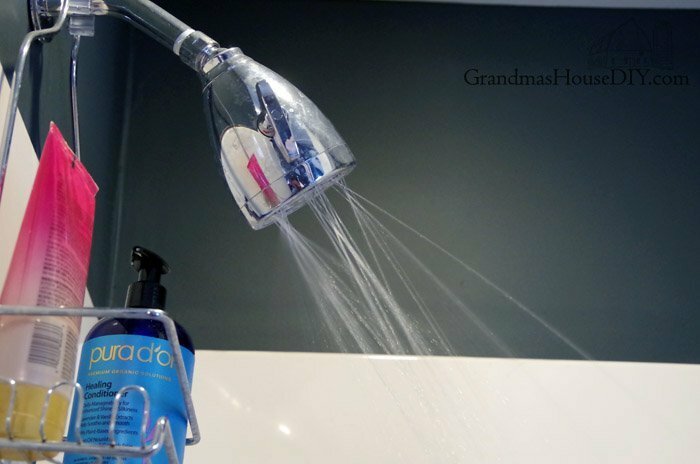 However, I did get a real laugh when I did a google search for on demand hot water heater problems and the first one that came up was, “Shower not getting hot water.” So, I’m not the only one that ran into this situation and I have to believe that any “low flow” shower heads or faucets would literally never get hot water – so that’s something you have to keep in mind if you consider going on demand. Now I purchased the biggest on demand hot water heater that they make so it would take care of my whole house and if I could go back I think I would have installed a small on demand hot water heater on every floor instead. It would have cost more (so much more electrical wire to run…) but smaller on demand water heaters require less water run through them to kick on. So then I wouldn’t have ANY of these issues at all and if you look at the manufacturer websites for these things, that really is what they recommend. So, if you’re considering going on demand I would recommend you purchase a small one for every floor or one for each kitchen and bath. Hope that helps if you’re considering making the switch! By ‘on demand’ do you mean the same thing as a tankless hot water heater? We’re considering switching to a tankless heater at our house. 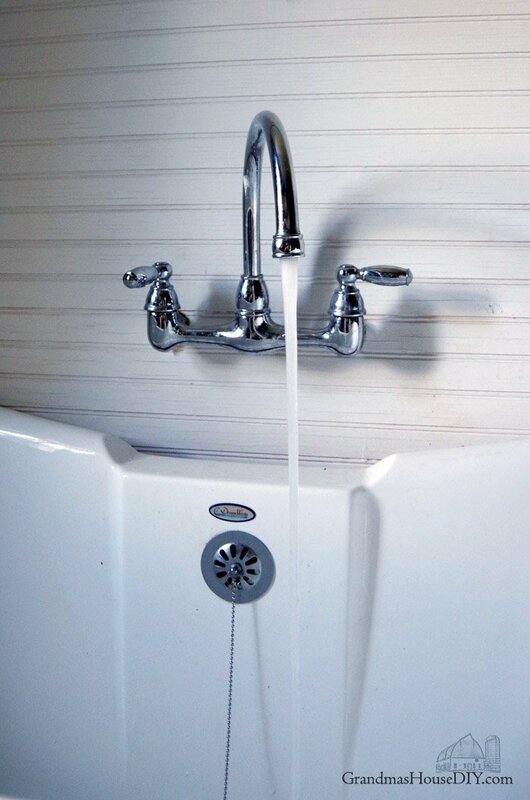 We use well water, have not water softener & have low water pressure. After reading this I’m wondering if we should reconsider. Hi Jenny! Yup it is the same thing as a Tankless Hot Water Heater 🙂 Well, you might really benefit from just calling the manufacturer and letting them know your situation (which sounds exactly like ours!) they probably will have some pretty good advice. I think if we had two small tankless water heaters we would be a LOT better off! Oh my gosh…..So glad you wrote this post. My husband has been wanting to make the switch for a long time now. We don’t know anyone who has one so of course we were only hearing the good. This gives us some pros and cons to discuss before actually going through with it. I really like your site! Thank you so much for sharing this. I’ve been looking into a tankless water heater for a few years because they seem so much more efficient. 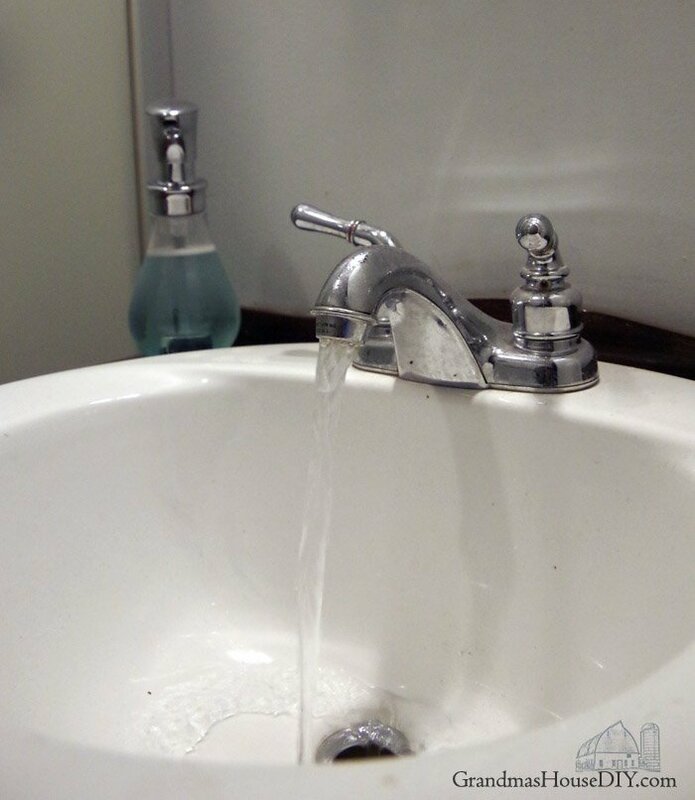 I’m really glad to know about the water pressure issue because we live in California and have lo-flow everything. Hey Rebecca, your low flo situation is definitely something to keep in mind if you decide to go tankless. Regardless of our issues though I would still recommend them, thanks for coming by! We are about to start renovating our RV and we are talking about putting one in. Our goal is all electric in our RV and my brother in law put a tankless hot water heater in his. Oh Sheena, a little tankless water heater would be perfect in that situation! We have a tankless hot water heater and we have had the same problems. 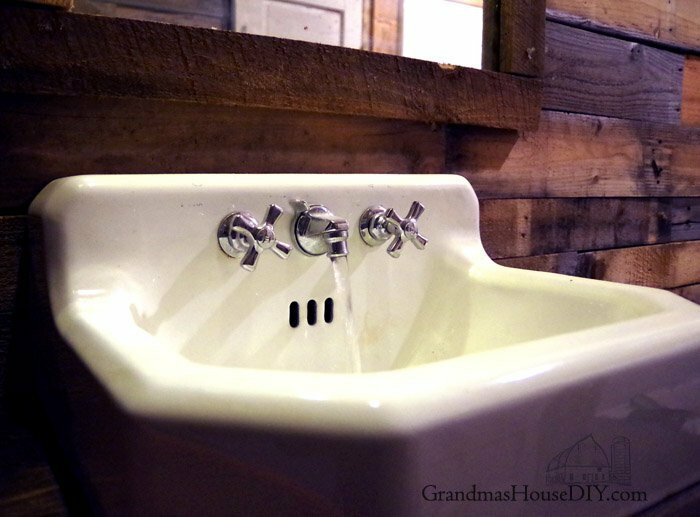 We have a 1000 sq ft ranch house and it takes so long to get the hot water to the bathroom sink in the middle of the house, I rarely use the hot water for a quick wash of my hands. Or, I start the water running before using the toilet to ensure a warm wash. I also hate that I have to keep the water running with force to keep the water hot when working in the sink. It feels very wasteful of water. That being said, having three teens and always being the one the hot water ran out on, I love the endless hot water. And that’s how I put it to people who ask me how I like the tankless. I tell them it’s endless hot water, not instant hot water. Hey Lace, you summed it up perfectly! Despite the issue and, I totally agree, wasting water waiting for the hot water! I would still recommend them because the hot water is truly endless! These are very common in the UK, we call the combi boilers as they do the combination of the central heating and the hot water generally. We had one in our first 2 houses but now we have a water tank. Water pressure is your main problem isn’t it, get that right and they work great. In both cases our boiler was up in the bathroom upstairs and that did mean we rarely had a problem with the taps not being open enough so luckily we were able to mix hot and cold (my husband likes his showers WAY hotter than I do) . Although in house 2 we did get a some sort of pump to help with waterpressure for the shower, I don’t know if you can get the same where you are. .I would think of them as best for smaller houses, definitely a money saver for small households. Once you have a bunch of teenagers showering every 5 minutes they become less economic. At least that’s what we have found. Not sure how helpful that is, I think this is a valuable discussion to be having, especially reading the other comments. Seems people are not sure whether to switch or not. Julie, thank you for sharing your experience! I agree they are definitely more economical for smaller households though one gal mentioned that living with three teenagers she loved hers because the hot water never runs out! I don’t think they’ve “perfected” them yet but I do think they’re on the the right track and, despite out own cons, I would still recommend them. Thanks for reading and coming by! This is really useful information. I will consider your experiences before purchasing an on-demand heater. Glad I could help Barbara, thanks for coming by! Not sure what we have, but always have hot water. Cold showers are no fun!! Thanks for sharing with SYC. Thanks for your honest assessment. We just replaced our dishwasher and garbage disposal, and our plumber recommended against the instant on water heater we were thinking of installing. He said he replaces them about every 2 years when people have them. Also, we have a tankless water heater so our tank is already energy efficient and supplies all the hot water we need. Hi there, thanks for coming and reading! I’m kind of confused, as far as I knew a tankless hot water heater and an on demand hot water heater are the same thing? Thanks for sharing this. We’ve been talking about getting one for a while so I found this very interesting. I’ve pinned it to share with my husband. Thanks for coming by and reading Donna! Interesting. I didn’t know anything about these. Thank you. Oh wow, I didn’t know anything about these water heaters. Thanks for sharing at the #InspirationSpotlight party @DearCreatives have a great 4th of July. Thanks for coming by Theresa, hope you had a great holiday! Thanks for all the hints! I am having an on-demand hot water installed in my small cottage (14×24), but only running hot water to shower and kitchen sink (living in Florida, it is not needed elsewhere). Your hints may well keep my frustration level under control! Thanks! Thanks for coming by and reading Nancy, hopefully some of my tips and tricks will help you along the way! I just cleaned my shower head and to do so I just took it off and soaked it in vinegar for an hour and bam, like brand new! We also use a tankless hot water system. Ours is propane, since we live off-grid. We had to adjust the water pressure knob on the water heater to stop the problem with cold showers. It still gets wonky if I use the button on the shower knob to turn off the spray (like when shampooing the dogs) but overall that solved our problem. I agree though, that smaller units in each room with water needs is the way to go in the future. One issue we have though, is in summer, here in Sunny South Carolina, the cold water is hot at first, (the lines are shallow here) so it can be sneaky to think we have the water adjusted then the real cold water comes through!! Danielle, thank you for sharing your story with us! lol it sounds like you know exactly the cons with going tankless right now, I’m glad we’re not the only ones! We just got our shower head clean so (hopefully) we won’t have cold showers for a couple of months! We replaced our 3 conventional hot water heaters with a single tankless hot water heater 5 years ago. It runs in natural gas rather than electricity. It is located in the basement of our 3 story Victorian home built in 1890. I wondered if it would really be able to handle 4 bathrooms, clothes washer and kitchen sink and dishwasher! It takes about a minute to water heated up to the third floor bathroom but a minute is not long to wait!!! Our gas bill has gone down appreciably and so has our electric bill since 2 of our 3 previous water heaters were electric and only the third one was gas! We are over the moon pleased with the result and have saved tons of $$ with this!! Thank you so much for coming by and sharing your experience! YES, I think they definitely save us money and we’ve been really happy with ours too! Tarahlynn thanks for the awesome presentation. I will consider your experiences before purchasing an on-demand heater. I just had to read portions of this out loud to Hubby as his father has a one of these in the house where we stay up north and it NEVER HAS HOT WATER IN THE SHOWER unless you run the water in sink at the same time. I can’t believe it’s not just us!! I’d love for you to share over at a new party called Let’s Party https://themarkandjanshow.com/2018/01/02/lets-party-6/ … we look forward to seeing you there! Hey Jan! Yeah I’m a little put off by the whole thing lol I think its saving me a lot of money though! I need to clean my shower head out because that helps a ton. I think, in the end, my only real way to “fix” it would be to install a bigger pressure tank in my basement. Thanks for coming by Jan! Tarahlynn, thanks for presenting “the other side” – you’ve given me a lot to think about. Hope I can come to a decision before old standard water heater goes out! Hi Jean, thanks for coming by and reading! Hi Tara. What an interesting story. Who new water heaters can be so fussy? I appreciate the advice of getting multiple small water heaters and having one for every floor. Anyway, it must be so cool to live in your Grandma’s house. I bet it’s like living in a memory wonderland. I wish my grandmother’s house was available for purchase. Hi Joy, it is a wonderful home to live in because it felt like home my whole life! I’m planning on (hopefully) upgrading my pressure tank and that will increase my water pressure throughout my whole house and I think that will help a lot! Oh wow, I didn’t know anything about these water heaters. Thanks for sharing this, it really helped us a lot. Keep on posting useful blogs!